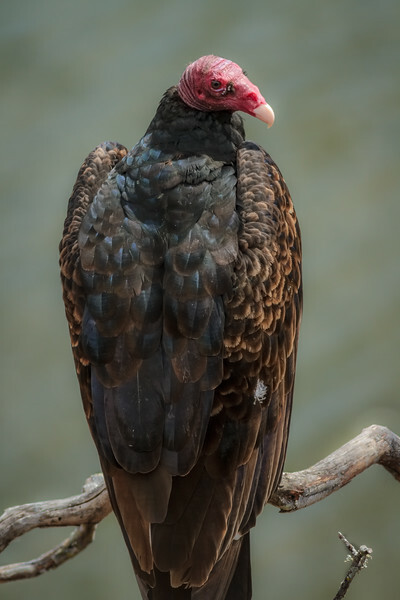 The turkey vulture (Cathartes aura), also known in some North American regions as the turkey buzzard (or just buzzard), and in some areas of the Caribbean as the John crow or carrion crow, is a vulture that is the most widespread of the New World vultures. One of three species in the genus Cathartes of the family Cathartidae, the turkey vulture ranges from southern Canada to the southernmost tip of South America. It inhabits a variety of open and semi-open areas, including subtropical forests, shrublands, pastures, and deserts. Like all New World vultures, it is not closely related to the Old World vultures of Europe, Africa, and Asia. The two groups strongly resemble each other because of convergent evolution; natural selection often leads to similar body plans in animals that adapt independently to the same conditions. The turkey vulture is a scavenger and feeds almost exclusively on carrion. It finds its food using its keen eyes and sense of smell, flying low enough to detect the gases produced by the beginnings of the process of decay in dead animals. In flight, it uses thermals to move through the air, flapping its wings infrequently. It roosts in large community groups. Lacking a syrinx—the vocal organ of birds—its only vocalizations are grunts or low hisses. It nests in caves, hollow trees, or thickets. Each year it generally raises two chicks, which it feeds by regurgitation. It has very few natural predators. In the United States, the vulture receives legal protection under the Migratory Bird Treaty Act of 1918. Avila Beach Bird Sanctuary Photographer, Cary L. Geihs. All Images Copyright © 2014-2019 Avila Beach Bird Sanctuary "TM" All rights reserved.